First Time Buyers - Why House Hunting is not a fun past time! Despite all the doom and gloom in the media surrounding the housing market, Pocket Monster and I are trying to embark on buying our first property. The mortgage is there as is our deposit, the only problem is trying to find somewhere in the area we want that is suitable. The biggest problem is that we know what we want and unfortunately most other people want the same. So our specification is '2 bedroomed house, with garden (not concreted over), near a station with good links to Central London. It needs to be in need of modernisation or a complete refurb. We want a house to make our home, not live in someone else's idea of a home'. Maybe we are being a bit picky but within a week of deciding to buy, we went and viewed our perfect place. Lived in by an old person who was a heavy smoker, the place needed a massive clean to rid the tobacco on the walls and celling, there was no flooring down so needed that doing too, the heating system although there was old and would need a combi boiler to bring it up to date, and the kitchen and bathroom would need replacing at some point too. Great we thought. So we put in an offer. The estate agent said they would call us back the following day but we heard nothing all day. The day after I rung them for them to tell me they had 'misplaced' my phone number. They told me that unfortunately we had been outbid by a 'cash' offer (so either a developer or someone buying the place as a buy to let) but if we were willing to increase our bid we might secure the property. Given the amount of work needed, it wasn't worth putting in a higher bid. And now we are back searching the websites and papers for other places. I keep reading at the moment that there is a lack of housing. Somehow I disagree. If we wanted a flat, there are plenty and all well within our budget. As we are looking for a house, it is a very different story! 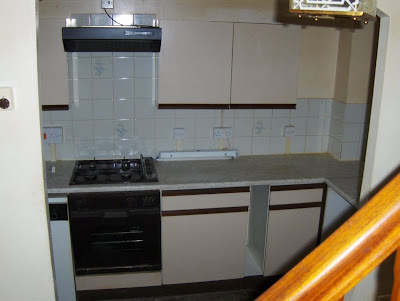 Apart from the fact many have been converted into flats, all those that are still available are in undesirable areas or have already been modernised to the point there would be nothing to do other than clean once we moved in. I am not sure what I can say about the rest of the nation but in London and the surrounding areas, trying to buy a house for the first time is a nightmare. I have lived in flats for a few years and even the place I lived in at University didn't have a garden so now I want to upgrade to a place where I can have a vegetable patch and a herb garden and somewhere to eat and cook in the summer months. Balconies are ok but lets face it, they are not the same. I feel like tearing my hair out. This will be the biggest purchase of my life so far and rather than feeling like I have time to think about things and consider all the options, I have to act faster than I would when I see the last of my size in a top I like, in House of Fraser, in the Sales! The fact of the matter is, although house prices are falling outside London, they are still rising fast in London. Therefore we are not in a position to wait around. I have already seen friends places gain over £40k in value within the last 18months. Its a nightmare. Fingers crossed something comes up soon.